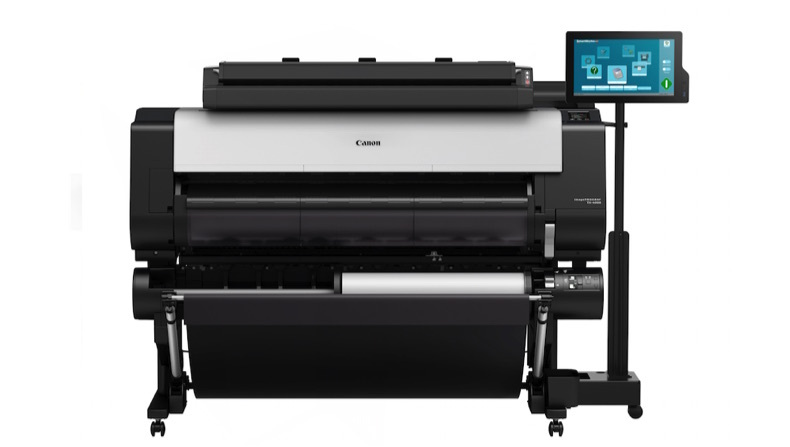 Canon has launched a completely new line-up of large format inkjet printers: the imagePROGRAF TX-2000, TX-3000 and TX-4000, available in 24-inch, 36-inch and 44-inch sizes. The new devices offer productivity, usability and security, alongside beautiful print quality and low running costs, making it ideal for both the high-end CAD inkjet market and the entry-level LED plotter market. The series also includes an MFP solution, imagePROGRAF TX-3000MFP T36 and TX-4000MFP T36, equipped with fast scanning, and newly developed Lucia TD pigment ink. With updates to all core technologies including the ink system, printhead and mechanical platform, the new imagePROGRAF TX series printers are "perfect for customers looking for high-production, high-quality printing, in colour and at competitive speeds," the company said. The newly developed Lucia TD ink produces fine lines, sharp text and vibrant colours, making it perfect for high-precision CAD drawings and posters alike. Specifically formulated for weather resistance, including water resistance, printed drawings can be viewed at outdoor construction or engineering sites, in long-term storage and on outdoor posters. It can print to plain paper and Canon claims that the image quality is good enough for posters on both coated and uncoated paper. "Where previously, CAD drawings were printed in centres using LED plotters, today, many offices or construction sites require their own inkjet printers to produce drawings on demand," said LFP Product Management manager Hiroaki Shirakawa. There’s an option to fit two rolls so that you can easily switch between different media, which is fairly common nowadays with CAD printers. The imagePROGRAF TX series also accepts rolls up to 170mm in diameter, with the lower unit equipped with a multifunction roll system, enabling users to take advantage of the continuous output and rewinding printouts on rolls. A new high-capacity stacker also offers holding room for 100 A0 sheets, and can be easily folded up to save space when not in use. The two MFP models, the TX-3000MFP T36 and TX-4000MFP T36, come with a built-in 36-ins scanner and a 15.6-inch touchscreen panel as well as the SmartWorks MFP version 5 with customisable menus and buttons. The new copy and archive mode improves productivity and makes it ideal for supporting office workflows, whatever the printing environment. The intuitive UI, straightforward roll loading and direct printing from USB flash drives offer optimum usability. All of these printers can handle data-heavy HP-GL/2 CAD files, can integrate with office workflows and support direct printing from USB flash drives. This new TX series also gains disk encryption, protocol locking and secure data transmission with measures such as SNMPv3 and IPSec support to prevent leaks and intrusions. “The newest line-up of products has advanced features to expand into higher-volume print markets, in a compact model, suitable for any office size. The imagePROGRAF TX Series is dedicated to a high balance between print quality, speed and productivity, alongside other enhancements such as more reliable security,"
"Fast printing, high-precision, usability and compatibility with CAD systems are fundamental requirements for both users of high-end inkjets and entry-level LED plotters. We’re looking forward to launching our new product line-up this year,” concluded Shirakawa. The new imagePROGRAF TX series and their MFPs will be available across EMEA from early December 2017.